It’s going to be an exciting year for 90s hip-hop fans, with three of the decade’s biggest names teaming up for a giant tour around North America! 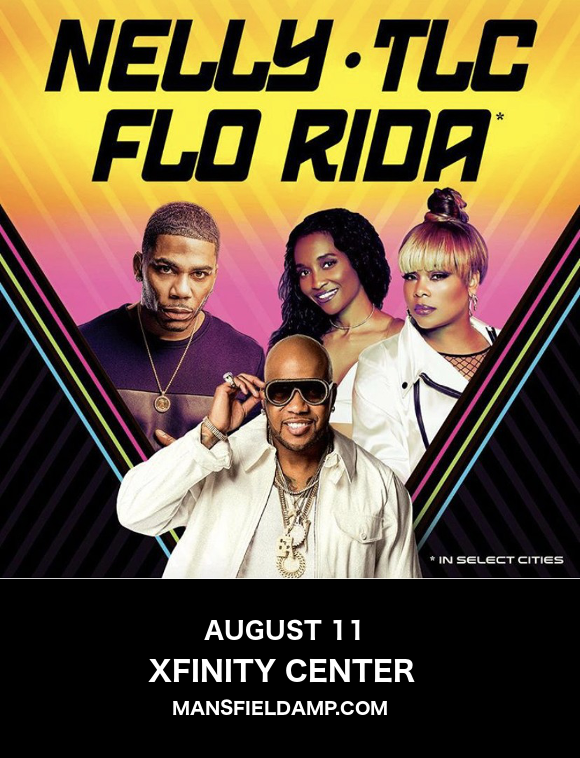 That’s right, it’s time to welcome Nelly, TLC, and Flo Rida to the Xfinity Center on Sunday 11th August 2019!! Tickets have just gone on sale – get ‘em before they disappear!! Nelly blasted onto the popular music scene in 2000, with his debut album “Country Grammar,” which shot into the top 5 of the Billboard 200 and went on to hit number one – today, it is his best-selling album, with over 8.4 million copies sold just in the United States. His last album, “M.O,” was released in 2013, so the time for new material is more than nigh – and the rapper has indicated that the time for new music might be fast approaching. As for TLC, they made a huge comeback two years ago with their first album in over a decade since the tragic death of their third group member, Lisa “Left Eye,” Lopez. Second only to the Spice Girls in the girl group rankings at the time when they were biggest, TLC’s legacy lives on with new material that bangs just as hard as anything they’ve ever done before. Finally, opening act Flo Rida, who has been teasing new music on instagram, is bound to hit the stage with a combination of all the massive hits you know and love in addition to some all-new material ahead of the new album release!! Well, what are you waiting for?? Get those tickets while they last! !